The real danger for Identity Theft comes from adware, spyware and viruses. Adware collects sensitive data about you and ships it to its designers. They use that information to obtain money from your credit cards and your bank account, usually by purchasing merchandise. That is why imperative to have an antivirus is watching constantly. In addition you want to prevent identity theft, don’t you? I’m not trying to alarm you, but if your computer get’s infected and you’re using it for banking and other financial transactions, then it might be possible that sensitive information might end up in the wrong hands. Therefore it is useful to use the best precautions for identity protection. Your Email User Name and Password should always be different than all the other user names and passwords for all other online accounts. That’s because if someone compromises your Email, then it is very easy to reset the passwords on all your accounts and find out all your user names. All emails from your bank, PayPal, and all other online accounts have to address you by your name! “Not by Dear Chase customer”, or “Dear Bank of America customer”! If you see that, it’s a fraud. Don’t click on links inside of suspicious emails that might address you by dear customer instead of your name. Use the main website for logging into your accounts. Always double check the link in the address bar of your website when you are logging into your credit cards and bank accounts. The connection is always secure, and it starts with https://. You should memorize the web addresses of all the institutions with which you are making online financial transactions. Always verify the web address, and always avoid clicking on links from bogus emails. Try to type in the links manually. When software asks to install additional things (toolbars or other programs), don’t allow it, you don’t need it. All banks, credit cards and other credential requiring web sites, have the “https://” instead of “http://”. Https: represents a secure connection. How to detect bugs adware and spyware that mightlead to Identity Theft. If your computer starts being slow and unresponsive for long periods of time, it might be possible that is corrupted by adware and spyware. If pop-up windows start out of the blue and things don’t seem to run as they were when the computer was newer, something might be happening in the background. The best way to scan a computer is when the infected operating system is shut down or not running. In this fashion the residing bugs are not active and they cannot suppress the antivirus you’re trying to run to verify the computer. To do so you need a live CD or Boot CD that has some adware and Malware tools on it. You boot from the CD and then follow the CD’s instructions. Here at TheComputerManual.com we made a CD which will help you scan your machine while the residing Operating System is not active. The CD itself contains it’s own Operating System from which the Malware scanner will try find all the problems that it knows of. You can Download the MalwareBytes Boot Disc and after you have burned it on a CD you can put it to work. Or you can Download a new antivirus and scan your entire computer to see if you find anything, if you can’t get the computer to install the antivirus then it means that the virus or adware is suppressing the Antivirus. If you can’t run the task manager, and you get the message that “The Task Manager has been Disabled by your administrator”, then is 99.99 percent chance that your computer is infected the Task Manager never comes disabled, unless this is not your computer and it is administered by someone else who knows what she’s doing. 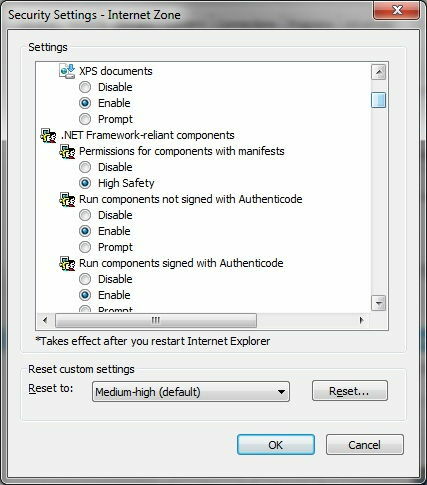 To further test that you’re not infected try running “regedit” in the The Run Dialog Window. If the registry editor doesn’t start then you most definitely got infected. Also try more than one antivirus since not all of them contain the same signatures database, therefore more chances of detecting something. If you have detected something and removed it, it doesn’t mean you’re completely clean. Take note of what you detected and cleaned and scan your computer again with the same antivirus. If you still find the same bug again then you might have to recover the computer from the recovery DVD’s or the system image. If your computer is still behaving out of the ordinary, it means that other bugs might be still active on the computer. They are very new. That is why is important to stay off the unknown or suspicious websites. To be completely safe, it is better to recover your computer to the factory defaults, or from a system image. It is very important to prevent Identity Theft with these procedures. All this extra work serves very well for Identity Protection. And you will be better off doing this work than doing the work of Identity recovery, or resetting all the credit cards accounts an being on the phone with all the institutions you make transactions with. Use antispyware software to scan your computer too. One good preventative method is to browse the internet from a virtual machine when you are going to fishy websites. Check out chapter 7 to learn about virtual machines. The antivirus, ad-ware software will only prevent your computer to get infected. Once the computer gets infected you have two options. Disinfect it if possible, or reinstall or recover with diverse methods. To reinstall from scratch you have to have already burned the Recovery DVDs or have the Recovery Partition intact. Those DVDs need to be kept in a very safe place, and make sure they are not scratched. To be sure you’ll have them when the time comes (because that time always comes), just make two sets and then try browsing their contents and copying some files back to your computer. The copying process insures that you can read the DVDs successfully. There is a tutorial further about creating your recovery DVDs so read that. But whatever you do, make sure you have those DVDs. Some computers give you the option to verify the contents after the burning process. If you’re a patient person you can wait trough the verification. I just usually try to browse the DVD and copy random files on the computer. If that works fine it means that the DVDs were created successfully. There is plenty of antivirus software for free. Go online and get yourself BitDefender, Symantec, or free AVG. There are others but you have to research that to understand which one is better. This software doesn’t guarantee that you’ll never get infected. So the best method for Identity Protection is to constantly apply what is explained here and stay off suspicious web sites. In addition you can sign up for credit monitoring with different vendors. They inform you of all the new entries and changes in your credit report. Moreover you can get credit monitoring reports which you can use when you do other transactions like rent an apartment or lease a car. You can use that information against the car dealerships, which I feel they have the tendency to give you a lower score, to charge more. Antispyware – same thing as antivirus, if can’t remove it after it has infected you have to reformat – or recover your computer. Sometimes it gets removed but the computer still doesn’t work well. Then one solution is to recreate a new user profile, by making a new user account in Control Panel and then logging into the new account. That is why you need to have the recovery DVDs. Even if you take it to a tech guy you still have to have the DVDs for him to install all that is necessary. Good Antispyware tools to clean your computer with are: Lavasoft Ad-aware, Malware-bytes, SpyZooka, Spyware Doctor and SuperAntispyware. Search online for others, read reviews to see what else is out and better. There is some clever spyware out there which will ask you for your credit card. They infect your computer and then present themselves as Computer Optimizers and they will require a credit card number to fix a list of problems that they created, or the list is bogus. Sometimes they look really genuine so pay attention. There is one example on this post about spyware and adware tips and tricks. If you look there are 4 zones in upper small window of the image above. In addition you can see that the Security Tab is selected. 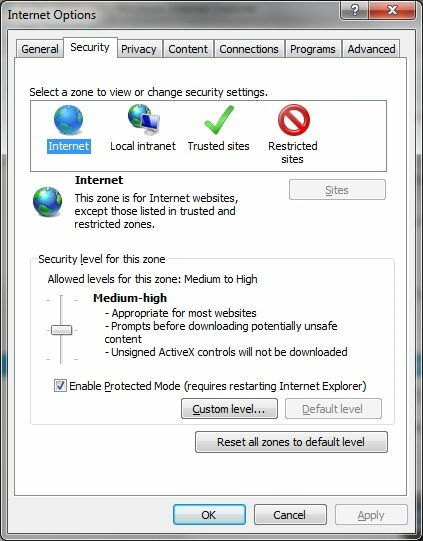 We are interested in the Internet Zone which is the first one selected. And below on the windows you can observe the Security level for the zone as Medium-High. You can make it all the way too highest to be safer. But this will hinder the way you browse the internet. In Addition you could Press the custom level button to select each feature if you want to enable it disable it or have it prompt you for action. However even for an advanced user knowing each selection what it does could be a bit extraneous. Below you can find an image on how the custom level security looks like. Another good prevention is to have a virtual machine installed and browse the internet from there. Then if you get infected you can just create another one from scratch easily in minutes, without having to install the OS from scratch or recover it in case of a severe infection. Virtual Box is described in the last chapter. Microsoft has its own Virtual PC but for our purposes Virtual Box will do. And if you want Virtual PC just download it install it and try to get it working on your own after you have followed the guidelines for Virtual Box. That should be good practice for you, researching and installing Virtual PC. Usually when your computer gets infected by a spy ware program it lets you know that your computer is infected and it asks you to purchase some software. Don’t do it, it is designed to steal your credit card info. It is safer just to try and remove the spyware with online tools available. But you should first try and log on to a different user profile and then try to work from there. Other tools that help a lot to disinfect your computer are found on at SysInternals®.com. These are the best practices on how to prevent Identity Theft.